The science fiction series Star Trek is peopled with various humanoid species living and working together, reflecting the philosophy of its creator, Gene Rodenberry, that diversity is a strength to be celebrated, a belief reflected in the Vulcan ideal of “Infinite Diversity in Infinite Combinations.” Among the issues of diversity that feature in many episodes, there are those related to disabled people. On the whole, the representation of disability in Star Trek encourages the viewer to challenge stereotypes about people with disability and to see them not simply in terms of their impairments but as people who go about their work in ways which are sometimes different from the norm; simply beings with “differing abilities.” This is especially the case for people with sensory or mobility impairments. They may see in a different way, communicate in a different way or move around in a different way, but they still give a valid contribution, and in some episodes it is their very difference that saves the day. When it comes to intellectual disability, however, the representation takes on a more negative turn. ‘To boldly go where no man has gone before” is the best known line from Star Trek’s opening sequence. It has created its fair share of debate—from the grammatical accuracy of split infinitives to arguments about whether the use of “man” was sexist. (It was replaced by “one” in later versions of the opening.) The line has also been adopted and adapted by the disability rights movement and turned into “to boldly go where everybody else has been before” (Direct Action Network). The point made by this take on the Star Trek line is that what disabled people, who make up 15% of the world’s population and are the largest minority (per United Nations Enable), want to do are the ordinary activities of daily life that nondisabled people take for granted. For Gene Roddenberry and the scriptwriters of Star Trek, disability is also an aspect of human experience that travels into the distant future and into the depths of intergalactic space. There are many episodes which feature characters who have a disability and where disability issues are brought to the fore. In this paper, we explore the representation of disability in three episodes of Star Trek: The Next Generation (TNG) and one episode of Star Trek: Deep Space Nine (DS9) from the late 1980s and early 1990s, a time when the demands being made by people with disability were no longer simply the struggle of a small group but had started to be recognized and adopted by governments worldwide. The chosen episodes are “The Masterpiece Society” (TNG Season 5 Episode 13, 1992), “Melora” (DS9 Season 2 Episode 6, 1993), “Loud as a Whisper” (TNG, Season 2 Episode 5, 1989), and “Samaritan Snare” (TNG, Season 2 Episode 17, 1989). The society that the Enterprise crew encounter on Moab 4 is not a homogenous one—there are men and women, people of different ages, and people from different ethnicities. There is no mention of religion—although given Roddenberry’s humanist beliefs it is doubtful that religious diversity would be scripted into the plot (cf. Grech 2013). Nor is there any reference to non-heterosexual relationships—the couples featured in the episode all are composed of a man and a woman. However, the absence of disabled people on the planet is problematized in the episode. After all, it is they who have been deliberately genetically engineered out of existence. “The Masterpiece Society” brings to the fore issues that are of very real concern for disabled people on Earth in the twenty-first century. Advancements in medical technology and in genetic engineering have brought about better outcomes for disabled people with different types of congenital impairments as well as those people who have acquired an impairment following an accident or an illness. These positive outcomes include longer life expectancy and the reduction of the deleterious effects of impairments, especially when they have been sustained through injury or disease. Conversely, these advancements have also brought questions about the very right to life for disabled people. Among these, one finds the issue of allowing abortions of disabled fetuses beyond the normal legal limits for abortions in general, legislation for assisted dying, and preimplantation genetic screening during in-vitro fertilization. These possible practices are predicated on a very negative view of life with a disability as a life of suffering and of a perspective of disabled people as being a burden on their family and their society. This view is explicitly articulated in “The Masterpiece Society” by Bates when she tells La Forge, “It was the wish of our founders that no one had to suffer a life with disabilities.” Many disability rights groups oppose these eugenic practices, including Not Dead Yet, an American grassroots organization which campaigns against assisted suicide and euthanasia of old, ill, and disabled people. As Charles Savona-Ventura and Victor Grech state, science fiction programs like Star Trek allow us to imagine what human society would be like in certain scenarios. This episode is a particularly good example of this, as Belanoff and Piller present to us exactly the scenario that Habermas would write about two decades later. Picard, captain of the Enterprise, sums it up when he argues that the inhabitants of Moab 4 “have given away their humanity”: “the uncertainty, self-discovery, the unknown—these are many of the qualities that make life worth living. Well, at least to me.” But of course it is not only for Picard that this is so. Some of the inhabitants of this planet, including chief scientist Bates, realize this and opt to leave their colony and live among humans whom they had previously considered to be their inferiors and with whom they had refused to associate. Bates goes so far as to turn the logic of selective breeding on its head when she equates it to living in the Dark Ages. La Forge also has something to say about the deliberate removal of people with disability when he asks Bates what right anyone has to decide whether he, and therefore also other people with disability, should exist. Therefore, away from the dramatic intervention to save Moab 4 and its inhabitants, this episode has two important messages about disability—that disability is part of the human condition and that people with disability have a contribution to make to society. The DS9 episode “Melora” delves deeper into the concerns of the disability rights movement by highlighting issues around how disability is created, the importance of taking the perspectives of persons with disability into account, and the nature of independence. In this episode, Melora is a new recruit to the Deep Space Nine base who, since she comes from a low gravity planet, has to use a wheelchair (which she calls a trolley car) to get around on board. Melora’s imminent arrival is the subject of an animated discussion among her prospective colleagues. They wonder “what it must be like” to go around in a wheelchair, “think what she’s been through” during her journey and wonder how “she flies across the room,” that is, the private quarters that have been adjusted for her low-gravity needs. Dr. Bashir refers to her as “extraordinary.” Already, before Melora has even arrived, she is singled out as being different and special. MELORA: I’m sorry if I seem overly sensitive, but I’m used to being shut out of the Melora problem. The truth is, there is no Melora problem until people create one. This may sound ungrateful because Doctor Bashir has been wonderfully helpful in the preparations for my arrival, but frankly I wonder why a medical opinion is necessary in this discussion. DAX: Julian [Bashir] knows more of your capabilities than any of us. MELORA: I don’t need a medical opinion to tell me my own capabilities. MELORA: I simply object to being treated like someone who is ill.
SISKO: I don’t see anybody doing that. MELORA: Try sitting in the chair, Commander. No one can understand until they sit in the chair. Melora has come to the base aware of the reactions that she is likely to provoke with her wheelchair. At first, she is very much on the defensive, eager to show that she is an ensign who has come to the base to do her duties just like any other ensign. She does not want the focus to be on her wheelchair, arguing that “there is no Melora problem until people create one.” Melora’s statement is based on a clear distinction between the impairment (in her case, the inability to move freely in a high-gravity environment) and the disability (her not being able to move around Deep Space Nine unless she has the right equipment and an obstacle-free environment). Melora remarks later in the episode, “What kind of an architect would design a raised rim at every door?” It is not the low-gravity way of walking that bothers Melora but the unnecessary obstacles that are unthinkingly created by a society that takes “no or little account of people who have physical impairments” (UPIAS and Disability Alliance 20). For persons with disability, in fact, independence does not simply mean doing everything on your own. Jenny Morris, another British disabled activist and academic, has written much about the subject of independent living (Morris 1999). Independent living is conceptualized in terms of people with disability living in the general community with the necessary support. What is important for people with disability is that the support provided, whether it is in the form of personal assistants or assistive equipment, enables them to live their lives on their own terms. Although the focus of this episode is on severe mobility impairment—especially on the wheelchair, the quintessential symbol of disability—it draws on the fundamental arguments made by activists in the disability rights movement. The issues raised go right to the heart of this movement and have resonance for people with different types and levels of impairment. The arrival on board the Enterprise of Riva, the Deaf protagonist of the TNG episode “Loud As A Whisper,” is as much discussed by the crew as Melora’s arrival is on board Deep Space Nine. However, unlike the Deep Space Nine crew, Captain Picard and his crew are not aware of Riva’s disability. Their discussion is about his reputation as a very skilled mediator, mentioning how it was thanks to him that the word “peace” entered the Klingon vocabulary. It is precisely for this skill that his services have been requested to intervene in the hostilities on the planet Solais V. When Riva arrives with his Chorus of three interpreters who can read his thoughts and interpret them into speech, Picard and the rest of the welcoming party have to do a double-take. Their focus suddenly shifts from Riva the mediator to Riva the Deaf Person, making his impairment and his means of communication the most important aspect about him. This is very typical of what happens to disabled people in their encounters with nondisabled people; it is their disability that becomes the most salient part of their identity. DATA: Yes, it is turning a disadvantage into an advantage. Learning sign will be a part of their process of learning how to live together in peace. TROI: While they are learning how to communicate with Riva, they’ll be learning how to communicate with each other. DATA: And that is the first and most important aspect of any relationship. Counsellor, it took me only moments to learn sign language. It will take them months. Riva turns out to be the ideal person to bring peace to Solais V not only because of his expertise in mediation, but also because his means of communication becomes the means for mediation. Another interesting aspect of this episode is that Howie Seago, the actor who plays Riva, was also born deaf. The portrayal of disabled characters by actors who have the same disability in real life is a much debated issue in disability rights circles. As Elura Psaila says, while the use of blackface by white actors to depict black characters is no longer acceptable, it is still considered acceptable practice for nondisabled actors to play disabled characters (cf. Psaila 2015). The arguments in favor of casting disabled actors include the fact that such actors do not have as many opportunities as their nondisabled counterparts for a part in most productions. Additionally, if a plot does include a disabled character, having a person with the same disability playing the part usually makes for a more authentic and realistic portrayal. “Loud as a Whisper” is thus another example of the way that Star Trek presents disability issues in an affirmative and positive manner. Together, the three episodes reviewed so far enable the viewer to challenge preconceived, often negative, ideas about disability. They also portray disabled people as giving a worthy contribution to the society they live in, especially when that society understands their needs and provides the means of assistance necessitated by their impairments. GEORDI: What seems to be the problem? GREBNEDLOG: Our ship is the Mondor. There are therefore several markers of the Pakleds’ status as people with intellectual disability. The Enterprise responds to the Pakled plea for help to repair their broken ship. The chief engineer, Geordie La Forge, goes on board the Mondor to fix the problem. But it turns out that the mayday call was a trap. The Pakleds acquire technology by relying on “good Samaritans” to board their ship to help, then kidnapping them and asking for technology as ransom. The Pakleds therefore use scheming, low cunning, and violence to get what they want. First Officer Riker, who is standing in for Captain Picard in his absence, goes so far as describing the Pakleds as “curious throwbacks,” a phrase that draws from the worst theories about the nature of intellectual disability. Counsellor Troi continues in the same vein when she argues that they are “unwilling to wait for the timely evolution of their species’ intellectual capacity.” Even if unwittingly, Riker and Troi’s argument is taken straight from the seriously misguided ideas engendered by Social Darwinism in the nineteenth century about the different rates of evolution of different types of human beings as discussed by Patrick McDonagh among others (cf. McDonagh 2008). It is rather ironic that the characters of a story set in a fictional twenty-fourth century should make use of a real-world theory from five centuries earlier and a discredited one at that. When John Langdon Down set out the typology of what is today called Down syndrome and called it “Mongolism,” he was not simply making a comparison with the almond-shaped eyes of people with this condition to the eyes of people in Mongolia. He was also drawing on the idea that “non-Anglo-Saxons, as well as Anglo-Saxons of lower social classes, occupied a lower rung on the evolutionary ladder” (McDonagh 268). People with Down syndrome, together with other “cretins” and “imbeciles,” as people with intellectual disability were then classified, were placed in the same category of less evolved humans thanks to what was called “recapitulation theory.” Riker’s description of the Pakleds as throwbacks and Troi’s argument about their needing to wait for evolution to run its course are dangerously close to this theory. Furthermore, at no point is the Pakleds’ ability to travel in space acknowledged as a positive achievement. PULASKI: You make them sound like petulant children. TROI: Yes. Infantile humans are known for responses of a similar nature. The crew of the Enterprise, including the captive Geordie, proceed to treat the Pakleds as children, using conspiratorial glances and condescending remarks, and even making sarcastic comments about their limited abilities in front of them—all of which are slights that many people with intellectual disability are all too familiar with. Eventually, the Pakleds are tricked into thinking that they have been given the weapons that they wanted. Reginod exclaims “We are a force now. We will have respect. Power.” Respect and power are precisely what people with intellectual disability need. Not firepower, of course, but equal power relationships with those around them, especially family members and staff who work with them. Through such relationships, they can have a say in their lives, control over where and how they live, and choice about the activities they engage in. This is the message put across by a group of people in the United Kingdom with intellectual disability in their book We Are Not Stupid (Taylor et al.). The book is written in simple English and includes pictures that help make the text easier to understand. These two features may make it sound like a children’s book, but it is not. People with intellectual disability do need texts to be written in easy-to-read language, and often they do need support in learning to a far greater extent than other people. But that does not mean that they do not deserve respect as adults. The inclusion of characters with disability in various Star Trek episodes serves to highlight issues that are of concern for disabled people in their struggle for equal rights and full inclusion in society. These issues are often very complex, and the ways they are presented in Star Trek often challenge preconceived notions of what it is like to live with a permanent disability. This is especially the case when the issues concerned such as the nature of independence or the need for a cure are seen from the point of view of persons with disability or differing ability themselves. On the other hand, sometimes stereotypes and misconceptions are reinforced rather than challenged, especially in the portrayal of people with an intellectual disability. This shows how important it is to analyze the representation of disability in series and films such as Star Trek within the context of what disabled persons themselves have to say about their lives and about the obstacles they face to truly gain their rightful place in society here on planet Earth. Gina K. Abercrombie-Winstanley is the former United States ambassador to Malta. Dr. Anne-Marie Callus lectures at the University of Malta, Msida. Campbell, Jane and Mike Oliver. Disability Politics: Understanding Our Past, Changing Our Future. London: Routledge, 1996. Chappell, A.L. “Still Out in the Cold: People with Learning Difficulties and the Social Model of Disability.” In The Disability Reader: Social Sciences Perspectives, T. Shakespeare, editor. London: Cassell, 1998. Deal, Mark. “Disabled People’s Attitudes Toward Other Impairment Groups: A Hierarchy of Impairments.” Disability and Society 18.7 (2003). Direct Action Network. 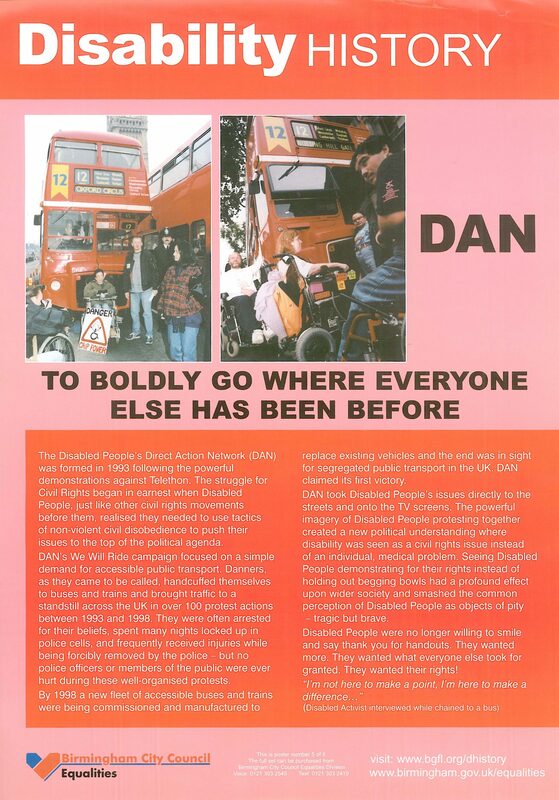 “Disability History: To Boldly Go Where Everyone Else Has Been Before.” Birmingham City Council. 1993. <www.worldofinclusion.com/res/qca/DAN_To_Boldly_Go_5.jpg> 18 December 2015. Accessed 31 May 2016. Driedger, Dianne. The Last Civil Rights Movement. London: Hurst and Company, 1989. Goodley, Dan. “‘Learning Difficulties,’ the Social Model of Disability and Impairment: Challenging Epistemologies.” Disability and Society 16.3 (2001). Grech, Victor. “Philosophical Concepts in Star Trek: Using Star Trek as a Curriculum Guide Introducing Fans to the Subject of Philosophy.” James Gunn’s Ad Astra, Issue 2. (2013) <www.adastrasf.com/philosophical-concepts-in-star-trek>, 18 December 2015. Accessed 23 April 2016. Hasler, Frances. “Developments in the Disabled People’s Movement.” In Disabling Barriers, Enabling Environments. J. Swain, V. Finkelstein, S. French, and M. Oliver, editors. London: Sage, 1993. “Loud as a Whisper.” Star Trek: The Next Generation, Season 2 Episode 5. J. Zambrano, writer. L. Shaw, director. 1989. “Masterpiece Society.” Star Trek: The Next Generation, Season 5 Episode 13. A. Belanoff and M. Piller, writers. W. Kolbe, director. 1992. McDonagh, Patrick. Idiocy: A Cultural History. Liverpool: Liverpool University Press, 2008. “Melora.” Star Trek: Deep Space Nine, Season 2 Episode 6. G. Rodenberry, R. Berman, and M. Piller, writers. W. Kolbe, E. Somers, S. Baum, M. Piller, and J. Crocker, directors. 1993. Morris, Jenny. “The Meaning of Independent Living in the 3rd Millenium.” University of Glasgow Centre for Disability Research, May 1999. <disability-studies.leeds.ac.uk/library/author/morris.jenny>, 18 December 2015. Accessed 31 May 2016. Not Dead Yet. Not Dead Yet: The Resistance. <www.notdeadyet.org>, 18 December 2015. Accessed 31 May 2016. Obama, Barack. “Remarks by the President on The Americans with Disabilities Act.” 20 July 2015. <www.whitehouse.gov/the-press-office/2015/07/20/remarks-president-americans-disabilities-act>, 18 December 2015. Accessed 31 May 2016. Oliver, Mike. The Politics of Disablement. London: Macmillan. 1990. Prusak, Bernard, G. “Rethinking ‘Liberal Eugenics’: Reflections and Questions on Habermas on Bioethics.” Hastings Center Report 35.6 (2005). Psaila, Elvira. “Culture, Disability, and Television.” Considering Disability 1 (2015). <consideringdisability.com/cdj/disability-and-the-problems-of-representation>, 18 December 2015. Accessed 31 May 2016. “Samaritan Snare.” Star Trek: The Next Generation, Season 2 Episode 17. R. McCullough, writer. W. Kolbe, director. 1989. Savona-Ventura, Charles and Victor Grech. “Future Ethical Issues Involving Reproduction—with Examples from Star Trek.” World Future Review 2014, 6.1 (2014). Taylor, Jennifer, Vanessa Williams, Raymond Johnson, Ian Hiscutt, and Maggie Brennan. We Are Not Stupid. London: People First Lambeth, 2007. United Nations. Convention on the Rights of Persons with Disabilities and Optional Protocol. 2006. <www.un.org/disabilities/documents/convention/convoptprot-e.pdf> 15 December 2015. Accessed 23 April 2016. United Nations Enable. Fact Sheet on Persons with Disabilities. <www.un.org/disabilities/default.asp?id=18>, 15 December 2015. Accessed 23 April 2016. UPIAS and Disability Alliance. Fundamental Principles of Disability. 1975. <disability-studies.leeds.ac.uk/library/author/upias/>, 15 December 2015. Accessed 23 April 2016. Wolfensberger, Wolf. The Origin and Nature of Our Institutional Models. Syracuse, New York: Human Policy Press, 1972.